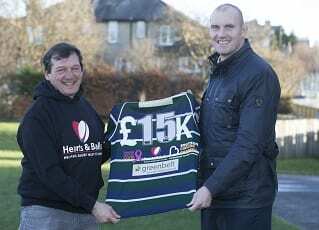 Hearts + Balls has appointed one of Scottish Rugby’s most famous faces as a director – former Scotland and Glasgow Warriors captain Alastair Kellock. The living legend decided to throw his efforts behind the charity after meeting many of the rugby players supported by Hearts Ballsand Balls. Al said “These guys are inspirational despite suffering life-changing injuries playing the sport we all love. Al is joined on the board by four Associate Directors, GHK rugby club’s Gregor Hollerin, London liason Harry Campbell-Lamerton, Heriot’s Alex Hagart and Stewart’s Melville’s Bruce Ruthven. There are now more ways than ever before to be like Al and support the cause. The charity is calling on Scottish Rugby clubs to take part in the Kiltwalk, which has events in Glasgow (April 29), Aberdeen (June 3), Dundee (August 19) and Edinburgh (September 16). It’s a great opportunity to walk together as a club and raise some much needed funds. While rugby brings immense pleasure and a sense of community, it can, like all sports, bring tragedy. Though it happens rarely, injuries can be life-changing. Hearts Ballsand Balls aims to ensure that, in times of need, those connected with rugby are supported by the sport’s community. Since 1999 the charity has donated around £450,000 to rugby players and their families, while also identifying and applying for funds and support from other sources. For spinally-injured players, Hearts + Balls provide new wheelchairs, specialist mattresses, additional carers, specialist home-equipment and more. This year, the charity is establishing a sevens team to raise awareness and funds. In April, the team will travel to Orkney for their maiden voyage, made possible by the support of Orkney builders and Kirkjugvar Gin. You can find out how to support through www.heartsandballs.org.uk, and by visiting our Facebook page. To register for the Kiltwalk, visit www.kiltwalk.co.uk, pick Hearts + Balls as your chosen charity, put on your boots and get walking!